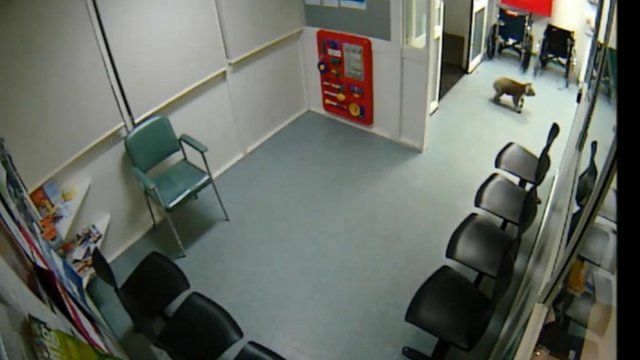 Koala strays into Australian hospital Jump to media player Security cameras at a hospital in Australia capture footage of a koala entering its emergency department. Koalas given mittens after bushfires Jump to media player Koalas caught up in wildfires currently burning across southern Australia are being given special mittens while they are treated for burns in a wildlife hospital in Adelaide. Why do koalas have deep voices? Jump to media player Scientists have discovered why koalas have such deep voices. Koala bellows with extra vocal folds Jump to media player Koalas have a specialised sound-producing organ that they use to make very low-pitched mating bellows, scientists find. Koala rescued from rabbit trap Jump to media player A koala is rescued after getting its paw caught in a rabbit trap. Security cameras at a hospital in Australia have captured footage of a koala entering its emergency department. The koala was filmed sauntering into the waiting area of Hamilton Base Hospital in Victoria in the middle of the night. Hospital boss Rohan Fitzgerald, who nicknamed him 'Blinky Bill' after a 1930s cartoon koala, said he walked around the waiting room for several minutes before leaving.